The Chateau is the highest point in the Entre deux Mers and has been a landmark in the region since the XVI century ! The wine is 100% Merlot which is made with very much XXI st century way and is aged for 15 months. 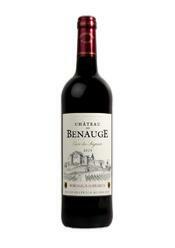 The wine is a brilliant garnet colour with delicate aromas of black fruits. Mouth filling and satisfying with a nice long finish.